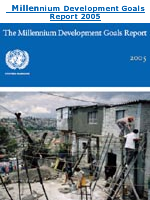 A status report prepared by 25 UN agencies and international organizations on reaching the internationally endorsed Millennium Development Goals has been issued Thursday, 9 June 2005 at the United Nations Headquarters in New York. Regional and global averages on progress towards the achievement of the Millennium Development Goals are now available at World and regional trends. An expanded version of the report, presenting more detailed data and analysis is available at Progress towards the MDGs, 1990-2005.